Goal Bureau International Advocacy Intelligence Council's strategic plan, develop and expand cooperation with any intelligence agencies, commercial information corporations and NGO's, information organizations or associations in order to create a common global information center on the territory of ID's government, and thus an International information center as the center of all global news network and therefore allow to use their own integrity and cooperation which means the right to use their own legitimate sources of information in the strategy of global organized intelligence cooperation and thus allow the broadcast real news without censorship and government stimulation, so we organized the ability to develop as a multi-intelligence entity with its own base integrity and global news and information network. Establishment of an International news center and the right membership information groups with the signature of a cooperation agreement in hand, legal representation and verified intelligence group, and so is the collective sum realized emergence format of the International community, and development of The ID's International Information City. Registered entity confirms its own and voluntary decision on cooperation and establishment of offshore centers in the territory of ID's International News city, as the format Representative and communications office which is freely available for informational, commercial, national, community and co-operative and intelligence interests for all members of the legal format of reporting groups and by the determination of the legal representative and manager of the intelligence group. The branch is also under the administration IAIC Authority as an entity in the Registry Management Corporation for business management. ID's form of government ID's Central Bank publishes all financial contributions in order to build the city offices and information points. The second step basic strategy before building the central office ID's International information city, so it is a common strategy of using a common mass forces registered members of International character, and the developments on the International level association and therefore to form an alliance by the organized structure of the internal management of the group. The task is to develop the rights of subjects of news networks, along with strategies to pursue all legitimate claims at an International level. Goal is to create a common information strategy and cooperation that involves development of International information cooperation for the opportunity to use a common reporting intelligence that this will be the ability to develop a global information network under the leadership of the team joint logistics network active as the name of one multy reporting entity ID's International Intelligence city and a global news networks all members, a network which will therefore develop a range of information by the forces of all members of the association. Objective IAIC and cooperation to the format ID's International news center is a vindication ID's rights and the purity of the names in the media and the fight against false, controversial, constructive and monopolistic news from the competition as one of the major concerns for the purpose ability to defend against neocolonialist and terrorist Information attempts to damage the rights of ID's sovereignty in their own countries and the free development of society, stabilizing ID's International Information City, each of us. Media agencies and groups that form a joint logistics network and International information cooperation which can be based on a network of International communication cooperation, meaning the ability to centralize and joint mobilization. Members of the association together create Intelligence for the creation of International conferences and summits, as well as agreements for the filming of the common commercial news programs and documentaries, or organizing public events during commercial partner name of ID's International news city. The main purpose of the collaboration is to create intelligence branches in the ID's and thus achieve success, meaning the development of a joint center of the global information network. This creates a ceremonial center and communications branches in the law for such an act all by information agencies and NGOs from around the world. The center of a joint independent logistics will be created under the nepotism integrity of government ID's. Development of ID's International News city will be based on the foundations of strategic cooperation with all NGO's communities from around the world together creating logistical operational network nature of politics, human rights, finance and economics, the movement against crimes, the military and the military, human development, and many other active logistics categories, according to the provisions of the act >Great Day for All Humanitarian Organization's "The Global act"<. King Peter Gottwald uses the ID's of International Information city for the purpose to establish "The Royal International University for Social Sciences and Global Strategies Company" and develop the cooperation and quality ID's education on a global level. Members of the association ID's International Intelligence city jointly organize the collaboration with world celebrities and develops interests and strategy entailing the development of partnerships with the subject ID's Popular government. Centre for International News city will be developed into a second center offices and communications, as levitating city in ID's territories and to Orbital line of Earth, as well as providing the ability to transport a permanent planetary connection using ID's technology. Further development of the Information ID's cities will be designated for development in the territories World Diamond International Alliance for growth and the ability to fully interactive cooperation of the Information Centre at the level of world politics. The World Diamond International Alliance is the body that allows each government of the country to join the multilateral cooperation of states leading independent joint sovereignty in the territories, especially the extent of celestial objects at the level of Galaxies. This creates a world center of International politics, trade, security and armies, civilizations and also society and the Intelligence or education and science. The best place for Intelligence activities, the center of all the major events of the world. Each member of the Intelligence Partner Entity always open access to the city, use of services and ensuring global information cooperation. ID's foundation of International information City, 600 new skyscrapers. 09. Together The Global Organizing City, re-designed for All Media Groups from around The World and create a common media in the form of joint investments between media organizations. Media organizations, agencies, corporations and other similar communities, therefore creating a joint media community which owns qualify for issuing joint of the Media of books, publications, magazines, then the right to conduct the Common broadcast on the radio and on the Internet, or other radio networks, also in the interest TV broadcasting and operation of a joint television channel radio stations. 10. All Media organizations from Around The World because their own right to create a common database of information and footage of the opportunity to expand their global processing in order to jointly broadcast through common channels and their media activities. 11. The center of The Global Organizing City is Common Joint center of World Media. 12. The government country of The World Diamond because its own duty to promote financial subsidies and the development of joint technology information databases or other forms of equipment. 13. 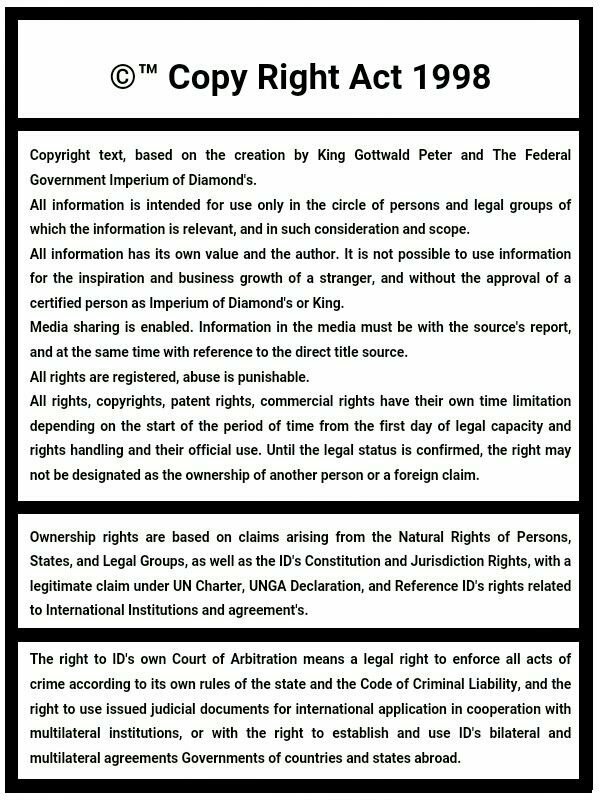 Every reporter or person with legal statute of medial factor, because its own obligations qualify for their own protection by the government of The World Diamond, if his freedom threatened and stripped of his rights. Anyone who will be the reporter or other media-active person, prevent the freedom and rights, such person will be claimed and enforced by a fine trial for endangering human rights of reporters agreements and the leadership of the movement against the international media association. 14. 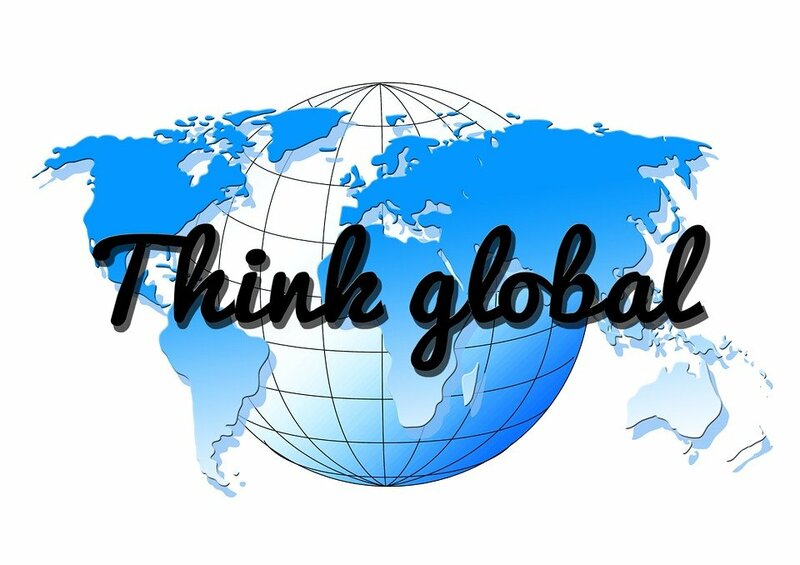 United in the form of a The Global Organizing Civilization based on logistics and cooperation of all communities around the world, developing our joint strategy. Therefore, any citizen or any other person from around the world fully enforceable right of access and use of common space in the interest of self-interest or for cooperation and policy development and political cooperation. 15. The government of The World Diamond obligation to create the city administration, development, maintain energy for the operation of civilization, construction and other centers or service. 16. The King of the land of The Imperium of Diamond's and The World Diamond therefore, pursuant to The Royal International University for Social Sciences and Global Strategies Company, headquartered in common Global Organizing Civilization of all organizations, communities and movements from around the world. 17. The Global Organizational City is based on a full freedom of communication, organizing joint strategy and cooperation, off communication and develop. Each user has a common civilization have its own duty to maintain all forms of international rules that determine the stability of world politics and the law of nations, governments and countries, or the government strategy of the country The World Diamond for full unification of all mankind. Contractual obligation on intelligence cooperation and information can create any entity agencies, associations or NGO based as Intelligence News Group. Terms contract must be confirmed by the legal representation of the reporting entity at validation options contracts during file lawyer or notary. Contractual obligation can be created at any time and in any location. Group intelligence activities affirms its involvement in building a network of International intelligence groups, in order to create joint forces as the largest global news and media network. News and information entity that confirmed own participation in the project, it simultaneously creates its own guarantee for Informational partner cooperation and efforts for cooperation to develop common legal name of the new subject entity. Confirmation of cooperation is interested in using the capacities and rights of partner cooperation between the commercial interests and the development of common international commercial activities of intelligence, and application collaboration and shared the common name of an International network of fellow members. Contracting Group confirms its own interest in order to promote joint media strategy to a common plan and logistics interests, creating a common center such as ID's Association International Information city which is the entity formed as a partnership of all intelligence groups involved in the project. Contracting Group confirms that it is in its interest to create an information logistical cooperation between the public and the media interests expand cooperation for the stabilization and development of ID's international information center. Contracting Party that owns the rights to develop the territory ID's International News City and use its partnerships with other media entities to operate public radio and television programs, media shows, public appearances, serials and documentaries and newspapers, using the ID's television studios and halls, printers, radios or centers, given the nature of the function ID's International Information Cities. A Common material can be applied as a production joint property association ID's International Information Citx which thus becomes a center of broadcasting or material will be used in order to apply between partner members on project. Contracting party owns the right to invest their own resources in the selected property ID's International Information City which may therefore be used as permanent session centralization of world media and usage for the purpose of commercial use. Contracting group therefore confirms that it will possess in order to use the ID's financial subsidies in order to create their own individual offices of the group as a Party in the territory of the ID's International Intelligence city. Contracting Party obtains rights nepotism own activities in the ID's of law and protect its own interests in the integrity of the government's ID and ID's International Information City. ID's Government guarantees that the treaty will not be misused in any way against any contracting party that the contract is not for espionage and infiltration or development of a network of organized crime. ID's government only confirms the emergence of self-government media center, a center that is open to all media networks worldwide, and for the joint exploitation of the world. Every category and opinion on Our World, together We can stand as a Global Ministry ! Who every one can Cooperate ?